enaio® lims is a module of the Laboratory Content Center, an ECM-based electronic management system for laboratory processes. 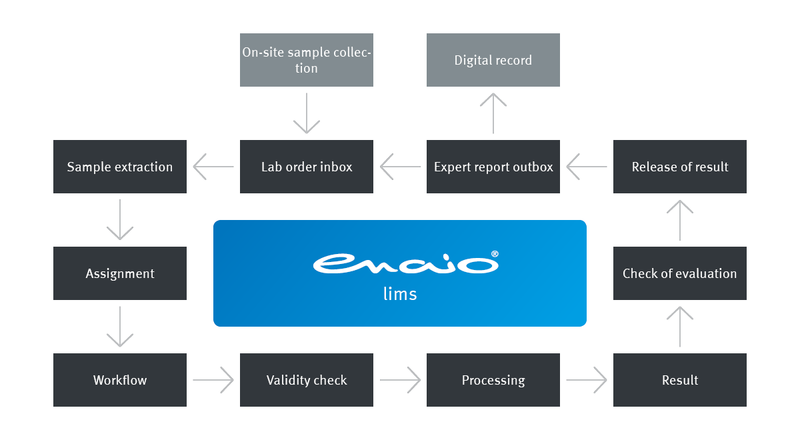 As an extension of the digital laboratory record (enaio® labs), this unique combination of LIMS and document management offers maximum flexibility and functionality in the automated processing and management of laboratory samples and measurement results for any field of discipline. It enables the complete integration of laboratory work into the process landscape of the respective company or facility. Workflows for efficient processes, from sample processing through to device management. Interfaces enable the integration with numerous third-party technologies. Laboratory processes with enaio® lims: Create new data with just a few clicks, including information on the examination method, complete with the plate barcode and current status. Due to the flexible scalability of the basic system, additional specialist and administrative departments can be added and individually configured in the form of digital filing cabinets. Using graphical editors for workflows, reports, and data structures, the system can be easily adapted to individual requirements. The database-driven document management system acts as a central location for electronic data, documents, and image files. It furthermore supports deep integration with the existing IT landscape by means of various standard interfaces. Customer-specific developments are already available for biological diagnostics, clinical chemistry, toxicology, food testing, environmental analysis, forensic technology, as well as the pharmaceutical and automotive sector. The experts from OPTIMAL SYSTEMS are professional partners for us. We especially like the day-to-day handling and the user-friendly user interface. We got a great solution at a good price.